I agree Muffy.I don't think she would allow her family to be harmed. or maybe you could shrink the #?? I guess nobody considered how much we would yap, and how popular JSM really is. 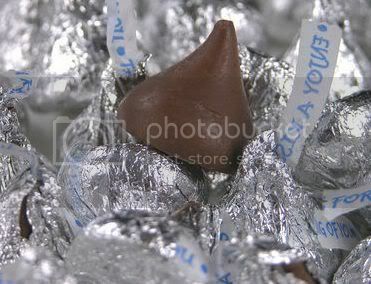 Since I am the Chocolate Czar..........let's have a snack. You have to admit this thread and the musing thread is pretty funny. Which by the way is true right now. The nephew is looking for a JOB so if he doesn't find one soon he may have Playtex Living gloves and Oven cleaner on his hands. Night Monkeys, I have been getting up later and later and am really behind tonight. Sleep well all monkeys. I will catch up with MT and her evil emails in the morning. I know she has dogs and will be fine. Could someone pass on a message from me to CBB because my computer is acting up? To answer your question NO. The moderators don't have time to create and watch every personal thread started in this forum, we only do it for MUSINGS and the Missing Persons thread. That's it. FYI - everyone has the ability (including JSM) to start a new thread here in the Monkey Lounge, you don't need the moderators to do it for you. I think she is gone, Mama. We will figure it out tomorrow. Here it is - midnight and everyone is gone. I got one of my photo albums done today. It was nice to take a break from all the BS that has been going on with the forums. I'll try to go visit my mom tomorrow. CAIRO, Egypt — Al Qaeda's No. 2 leader warned the Pakistani people in a new audio message that the U.S. interference in their country's affairs poses a grave danger to Pakistan's future and very existence. The English-language audio message by Ayman al-Zawahri was dated July 14 and addressed to "my Muslim brothers and sisters in Pakistan." In it, the militant group's second-in-command called on Pakistanis to join the fight against the United States or support the battle financially. He warned that without that help "we shall not only contribute to the destruction of Pakistan and Afghanistan, but we shall also deserve the painful punishment of Almighty Allah." Page created in 6.227 seconds with 19 queries.